Ghost Hunting Theories: Does Your Soul Take a Stroll? Does Your Soul Take a Stroll? Are there times in your life that you ponder if your soul might leave your body upon occasion and ramble around in your sleep or perhaps while you're getting surgery? There are some clues that our souls may not be as attached to our bodies during mortal phase of life than we assumed. 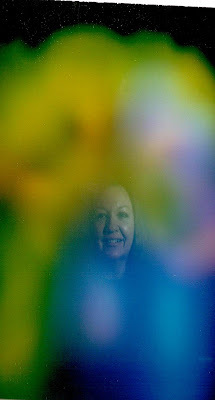 Some proclaim that our souls can be photographed as "auras" with a Kirlian camera. 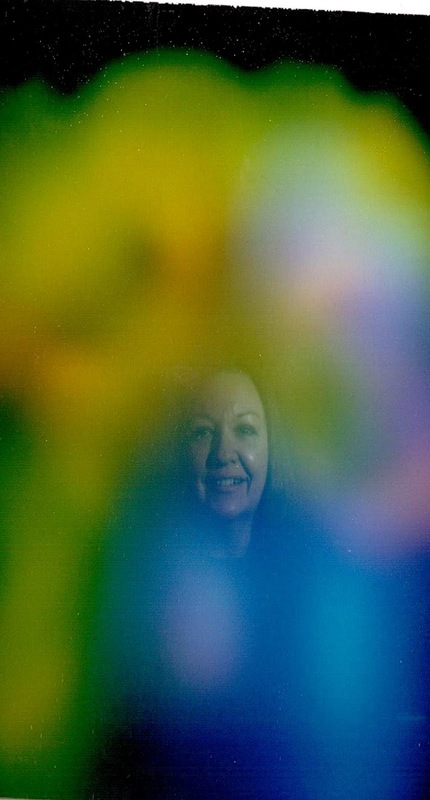 In this photo (above) I had taken weeks after my brother's death, I told the woman taking the picture with the Polaroid aura camera that I felt him over my right shoulder all the time. The rather eerie image could be convincing for some that the soul can be photographed. In this instance (below), I decided to bring forward all the spirits I feel following me, like a pack. One psychic told me they were Vikings and that makes sense, as my dad and his people were all from Norway and Sweden. When people have near-death experiences and show no signs of life, they often come back having described procedures being done to them from a perspective outside of the body. They also report having their soul rejoined with the body with amazing force. When I was 4 my dad took me out to trick or treat for the first time with my brother. But, first we stopped by one of the cottages on our property. We rented them out to students at George Mason University. One of the students was having a party. My brother and I knocked on the door and were let in by a costumed person to meet a gypsy with a crystal ball who told our fortune and then we entered the main room where the guests were crowded in. A man in a headless costume came in holding a head. I freaked out, my brother (5 years older) freaked out too. He had me pushed up against the wall and we were screaming hysterically. Dad came and got us out of there and he lifted me up to explain to my brother to go ahead and trick or treat but get candy for me too. My brother agreed after being sure I was okay. Even though he had been scared, he knew his baby sister must have been more scared. I waved him off and tucked into dad's arms. 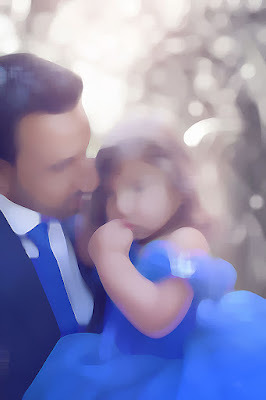 But his memory also includes me seeing it from outside of myself, watching me in my costume, my postures, my ballet-slippered feet dangling, in dad's arms, and dad handing my brother my candy bag. There are no photographs of this event and yet I have this odd perspective of it. I briefly recall looking down at my brother with the candy bag and the rest of the memories are from the left of my brother and taller, looking directly at me about 5 feet 5 inches off the ground. How do we sometimes shift our memories of events to include outside viewpoints when no photos were taken to prompt such a point of view later on? It may be that there is a synchronicity in recording events in which the soul is so touched that it imprints its point of view with the mortal's memories made from self perspective. This way, we can recall an event in a bittersweet way of being in two places at one time. Perhaps to get through tough situations or to understand something terribly spiritually uplifting, we need a guide that can protect us from our mortal perspective that is stressed by the event. Giving the event both the mortal from behind-the-eyes perspective and an outside perspective looking in shows us another point of view in order to survive the overwhelming input. This can be the same for physical mortal fear, grief, or even rapturous moments of spiritual connection that confuse us in their enlightenment. Have you ever had a moment where you told yourself "back away from the daydream, protect yourself"? Like when you start falling for someone too soon and you are scared, so you guide yourself away from those overwhelming feelings to keep your heart safe. So, the soul might do this for us during moments that threaten our mortal perspective; they give us a way to step back while we assimilate. 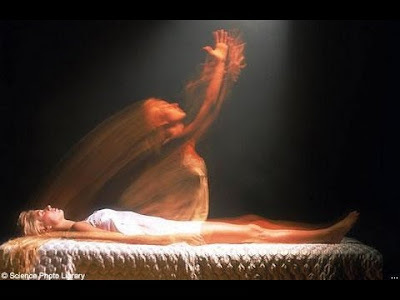 Astral projection is a popular example of the soul taking a stroll. This is the spiritual practice of willing the soul to take the body. According to practitioners, an "umbilical" keeps you tied to your body for return. I have had spontaneous events of this in my lifetime, always associated at sleep time. First, my body feels as if a thousand hummingbirds are beating their wings fast inside every cell of my body. The vibration is so odd, unlike anything I could possible describe accurately. Then, I find myself in a place I don't know. Almost every time, this has been with someone I spoke to online before bedtime. One time, I showed up in Greece in a woman's apartment and spoke to her. She was psychic and actually recalled it in detail. Another time, I was in England shopping at an outdoor market with a woman and asking her how to find a mall that I don't know (Clarendon Centre), as I have never even been to England, and yet I looked it up and the mall with that name exists there. I wake up in a vibratory state as I was when I left, and I feel as if I literally did travel and experience new smells, tastes, sounds, people, and the tiredness that comes with travel. Sleep and dream state are often reported as times the soul takes a hike while the body rests. Perhaps the soul is as restless as the body can be. In fact, our sleep state includes paralysis to allow us to not act out what we are experiencing. Does our soul go and experience the things we dream about? Science might disregard that notion as brain waves and eye movement show dream state is in the mind. And why would the body need to paralyze itself if the soul can leave and act out the dreams? There lies a vicious circle. What can we say about the soul's abilities and limits? Other than those of us redheads who wake up during surgery, we generally have no memories of surgery. And for that reason, some would say we either have no soul or the soul does not house memories or it leaves and so you have no recall. This is a bit tricky because, if during near-death you can reenter the body and recall the events outside of the body, why not when anesthetized? Why don't we wake from surgery recalling a stroll around the grounds? We know that the soul can escape when body systems shut down and under extreme emotional/physical distress. This a protective mechanism like when Adrenalin makes you stronger when you need it or endorphin's help you deal with the shock of a traumatic injury. Thus, we can get those situations in which a person swears he saw the events from outside of himself. That reported "time slowed down," might be a cue that we our soul is protecting the mortal from things they cannot comprehend. 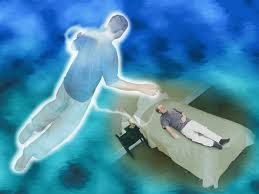 If astral projection is possible, then some form of consciousness goes with the soul to other locations or some element of our consciousness can project itself into new locations. 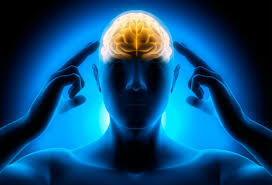 Remote viewing is such an example. In remote viewing a person can focus on a target somewhere in the world and describe that location, even though they are presently not there. Is there a stream of consciousness that we can tap and we call this the soul? When we travel out of our bodies do we get swept up in this stream of knowledge? The soul might also utilize the psychic senses so that a person can know things as himself, but also know more that extends beyond his self knowledge. Some refer to this practice as tapping the akashic records. The akashic records are reported to be universal knowledge that can be accessed, revealing all that ever was, is and will be. This is the knowledge many report being opened up to them during near-death experiences. My father, following his NDE, described it as "that is the real world, this one is fake." When one practices spirituality to a higher level and voices a greater consciousness and understanding, this is a time in which the soul may be letting its knowledge be known to the mortal mind. When something is particularly deeper than we can comprehend, we often say, "soul lifting," "I knew it in my soul," and "baring one's soul." It would appear that our mind's consciousness trumps all else for gauging the world and recording events. We cannot have soul's consciousness at the same time as mind's as far as taking in an event. The perspective is either through the eyes of the mortal or from outside looking at the mortal. But, there could be a possibility that the soul adds a "rounded" aspect to our viewpoint. John heads to the fireworks display to meet his friends and cuts through a meadow, hears the music, smells the fresh cut grass, and feels a sense of excitement and community. When the fireworks display begins, he watches in awe, realizing the others around him are also having the same amazing experience. He feels emotionally moved by this, but at the same time the connection for his soul has been made between music, fresh cut grass, lights in the sky, and thundering sounds. His soul adds a dimension to the experience by bringing it all together in a memory that can easily be evoked by the smell of fresh cut grass, resulting in a spontaneous sense of awe in the future. Does the soul take a stroll?